CFBT-US has just taken delivery of two Low Pressure Fognails manufactured by Waterfog AB, in Sweden. Fognails are small piercing nozzles with a flow rate of 70 lpm at 8 bar (18.49 gpm at 116 psi). Low Pressure Fognails have a maximum working pressure of 20 bar (290 psi) which will allow operation at pressures well above 100 psi for reduced droplet size and a somewhat higher flow rate For example, the Fognail will deliver approximately 91 lpm at 12 bar(24.28 gpm @ 200 psi). These Fognails will be used in field trials conducted by Central Whidbey Island Fire & Rescue (CWIFR). The Fognail shaft is 17 mm (0.67 in) in diameter and 530 mm (20.75 in) long and is pointed on one end with a reinforced striking surface on the other end. Water enters the Fognail through a pipe welded to the shaft just ahead of the striking surface. A 25 mm (1 in) threaded connection is provided. The threads are standard 1 in IPT (iron pipe thread). As received from the factory, the Fognail is fitted with a stainless steel ¼ turn valve which may receive and adapter for any type of hose connection. The Fognail shaft is 17 mm (0.67 in) in diameter and 530 mm (20.75 in) long and is pointed on one end with a reinforced striking surface on the other end. The Fognail shaft has coarse, straight cut threads on the shaft to assist in holding the Fognail in place when flowing water. Water enters the Fognail through a pipe welded to the shaft just ahead of the striking surface. A 25 mm (1 in) threaded connection is provided. The threads are standard 1 in IPT (iron pipe thread). As received from the factory, the Fognail is fitted with a stainless steel ¼ turn valve which may receive and adapter for any type of hose connection. Fognails are typically inserted through the roof or an exterior wall. 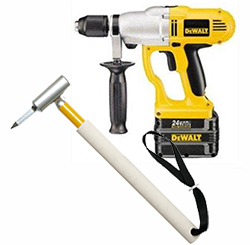 The initial opening is created using a spike hammer and the Fognail is then driven into place. CFBT-US decided to forgo the spike hammer as a Halligan or pick head axe could be used and serves multiple purposes. There are two types of Fognail, Attack and Restrictor. Both types of Fognail have a pointed tip, but the location and size of the orifices differ based on application. 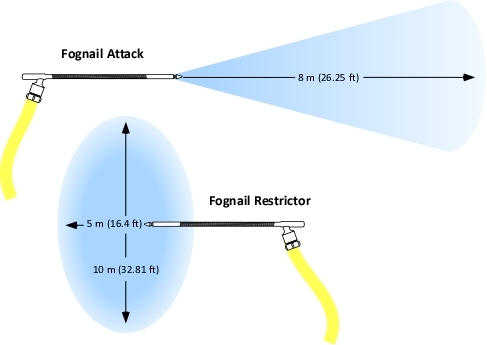 The Attack Fognail has 16 orifices at the tip and produces a 30o Fog Cone with a reach of 8 m (26.25 ft). The Restrictor has 32 orifices at the tip designed to provide impinging streams that produce a circular pattern of water fog 10 m (32.81 ft) in diameter and projecting a distance of 5 m (16.40 ft). 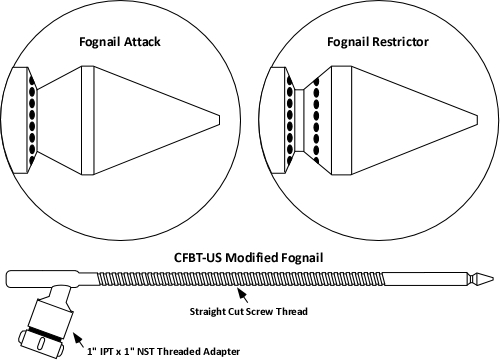 CFBT-US has modified the standard Attack and Restrictor Fognails by replacing the quarter turn valve at the nozzle inlet with a 1 in Iron Pipe Thread (IPT) x 1 in National Standard Thread (NST) Adapter to allow the Fognail to be supplied by 1 in hose equipped with NST couplings. Use of a short section of 1 in hose allows greater flexibility and reduces the weight of the charged line exerted on the back of the Fognail when it is in use. As modified by CFBT-US, the short section of 1 in hose is extended off a break-apart combination nozzle on a 1-3/4 in hoseline using a 1-1/2 in NST x 1 in NST adapter. The nozzle shutoff is used to control water flow to the Fognail. Fognails are used to introduce water in the form of small droplets into enclosed areas without the need for a large opening that would increase ventilation and the flow of air to the fire. Given the small droplet size from this nozzle, it is likely that water applied through a Fognail has the effect of gas cooling (vaporization while traveling through hot gases) and indirect attack (vaporization on contact with surfaces). Tactical flow rate requirements can be estimated using a variety of methods (most of which are used in training, but not on the fireground). The most useful method in considering the extinguishing capability of Fognails is the Iowa Formula, which was developed for the indirect method of fire attack. This formula determines the flow (in gallons) required for 30 seconds in order to achieve fire control (not extinguishment). If the flow rate from a Fognail is estimated as 20 gpm (76 lpm) and the Iowa Formula is solved for volume (Length x Width x Height), a single Fognail can control a fire in a compartment having a volume of 2000 ft3 (56.63 m3) with a 30 second application. With a ceiling height of 8’, this would be a 250 ft2 (23.23 m2) compartment. Note that control in a larger volume may be possible with a longer application (e.g., 60 seconds). For more information, see Estimating Required Fire Flow: The Iowa Formula. Fognails are not intended to be used as the sole method of water application in firefighting, but are integrated with other offensive or defensive firefighting tactics, depending on the circumstances. Consider the use of Fognails as a fire control (not extinguishment) tool. 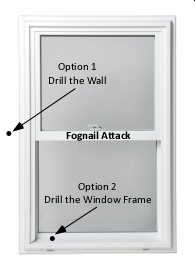 Attic Fires: Fognails provide several options for dealing with attic fires. One or more Restrictor Fognails may be inserted in the roof if it is stable enough to work on. Alternately, a combination of Restrictor and Attack Fognails may be used to cover a larger area or volume of attic space. As an alternative to working from the roof Attack Fognails may also be used through the eaves (existing or drilled openings) or from the gable ends of the roof. Fognails may also be used defensively to develop a barrier to fire spread to uninvolved areas of a larger attic space. In this application, multiple Fognails are placed to produce a dense barrier of water fog to serve as a fire break. Note that this may not be an absolute barrier and should be supported by interior handlines to check for extension. Fires in Void Spaces: Fognails provide an effective tactic for controlling fires in void spaces. In this application, Fognails may be inserted into the void space from the exterior or interior. However, if used on the interior, crews placing the Fognail(s) must be protected by a standard handline. 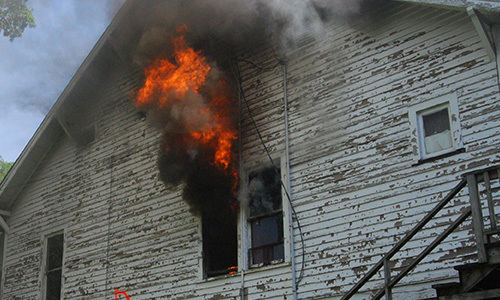 Unvented Compartment Fires: When a compartment fire has self-vented, a brief application of water from the exterior may be the fastest way to reduce the heat release rate (HRR). In other cases, it may be faster to directly initiate an interior attack. However, when staffing is limited and there is no known imminent threat to live (i.e., reported or visible occupants), operation from the exterior may be the only acceptable option. Under these circumstances, firefighters may be presented with a challenging decision. If water cannot be applied into the fire compartment from a door, do they break a window to allow exterior application of water? Breaking a window provides access for water application, but also increases ventilation. In addition, unlike a door which may be closed after water application, a window cannot be unbroken and the increased ventilation may allow fire growth in areas beyond the reach of the stream applied through the window. Use of a Fognail allows firefighters to introduce water into the fire compartment without increasing ventilation. In this case the Fognail (or nails) would be inserted through the exterior wall or window frame into the fire compartment. If multiple compartments are involved, multiple fog nails may be required or the initial fog nail may be move from one location to another. CWIFR will be training in the use of Fognails and will conduct live fire training designed to provide members with an opportunity to use Fognails under realistic conditions. More information to follow as it develops! Are We Defeating the Enemy? Jason Sowders recently wrote an post on the Fire Engineering in support 150 gpm (570 lpm) as the minimum flow rate for interior structural firefighting and the use of solid (or if not solid, at least straight) streams for interior fire attack. I commented on-line that many of the conclusions stated in Jason’s post was not supported by scientific evidence or the experience of many of the world’s fire services. Have a look at Jason’s post: Nozzle Selection: Are We Defeating the Enemy? and give some thought to what he has to day. What do you agree with, what do you disagree with, and why? I commend Jason on presenting his perspective in a public forum. While I don’t agree with many of the things that he has to say, putting ideas in a public space allows discussion and argument (using this term in its most positive sense) to improve our knowledge and understanding. Today more than ever, we have access to a tremendous amount of information via the internet and print publications. Some of this information is correct and some is not. To make things even more complicated, some of it is based on commonly held belief resulting from observation of the world around us, that seems quite logical and some of it is based on science which is sound but may seem to conflict with our practical experience. How do we sort through these statements, claims, and arguments? Think about what you know? What are your assumptions and biases (this may be the most difficult question)? What resources are available to help you develop a deeper understanding? Jason begins his post by asserting that warfighting involves precision, well thought out methods of attack and overwhelming force to obliterate the enemy. Both statements have an element of truth, but the military metaphor for structural firefighting while useful in some contexts has significant limitations. Consider the differences between a ground offensive in a war and a special operations mission to capture or kill a terrorist leader. Both have elements of precision and well thought out methods, but the later does not use overwhelming force to obliterate the enemy, but employs the force necessary to accomplish the task while minimizing collateral damage. Jason states that we are in a war and that fire has already invaded our homes, ready to show itself in a very “hostile” manner. The major fallacy in the use of military action or warfare as a metaphor for firefighting is the tendency to anthropomorphize the fire, ascribing humanlike characteristics such as thought and intent. An uncontrolled fire is not alive, it is not hostile, and it is not trying to kill either firefighters or civilians it is simply a physical and chemical phenomena that presents a hazard to life and property in either the natural or built environment. Chief Fire Officer Paul Young of the Devon & Somerset Fire & Rescue Service asked two important questions during a presentation at an Institution of Fire Engineers presentation several years ago: Are we participating in an individual struggle with a dangerous enemy? Or are we part of a disciplined, organized, and coordinated attack on an increasingly well understood chemical reaction? These points do not diminish the hazards presented by the modern fire environment, but frame a fundamental difference in perspective about our work. One is dramatic, exciting, and focused to a greater extent on an emotional response (which is necessary, but not sufficient) and the other recognizes that our work while difficult, physical, and requiring emotional strength, must be based on integration of scientific evidence and experience developed in the field. Jason asserts that the heat release rate of today’s fuels is catching firefighters off guard and that they need to be treated as highly flammable fuels. While this is true to some extent, the term flammability generally refers to ease of ignition (e.g. flash point of liquids, ignition temperature, etc.) rather than heat of combustion (potential energy) or heat release rate (HRR). Jason’s statement that “heat makes more heat” is nonsense at face value in that heat (thermal energy in transit cannot multiply itself. Chemical potential energy in fuel can be transformed to thermal kinetic energy, but it can neither be created or destroyed (law of conservation of energy). However, if the point is that HRR does not (generally) increase in a linear manner, but frequently increases in an exponential manner, is generally correct. Understanding the concept of heat release rate is critical to understanding and recognizing the hazards presented in the fire environment as well as the capabilities of water as an extinguishing agent. Jason asserts that flow rates below 150 gpm (768 lpm) are inadequate for interior structural firefighting without supporting this argument with specific evidence. 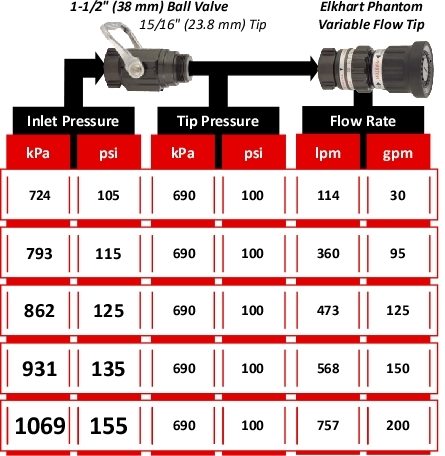 While I agree that a 1-3/4” hoseline with a flow rate of 150 gpm (570 lpm) is a reasonable choice for interior structural firefighting, there are many fire service agencies around the world that are quite effective with much lower flow rates. How can this be? Context is critical and it is important to consider building characteristics, fuel loading, and tactical framework. That said, it is interesting that the New South Wales Fire Brigades in Australia (who has similar buildings and fuel loads to those found in North America) typically makes entry to residential fires with a flow rate that is five times lower than 150 gpm (570 lpm). This large fire brigade serving both the city of Sydney and smaller communities is effective in fire control while having a firefighter fatality rate that is considerably lower than the US fire service. This is likely due to a combination of factors, but their typical flow rate and use of 38 mm (1-1/2”) hoselines does not seem to have a negative impact on their fire suppression performance. Jason provides an example of the effect of reducing line pressure on 200’ a 1-3/4” handline from 170 psi to 130 psi (to reduce nozzle reaction); stating that this would reduce the flow rate from 150 gpm (570 lpm) to 115 gpm (435 lpm) and that this would be “woefully inadequate and not a safe practice” as you would be simply containing the fire, not extinguishing it. The first part of this argument has an element of truth. Reducing the line pressure on a handline reduces flow rate. However, depending on the type of nozzle, there may be other impacts as well. An automatic nozzle will maintain its design pressure with reduced flow rate (as long as the flow is within the nozzle’s flow range). If the nozzle is a standard combination nozzle with a designed nozzle pressure of 100 psi (689 kPa) as evidenced by the original 170 psi (1172 kPa) nozzle pressure in this example, reducing the line pressure not only reduces flow rate, but also increases droplet size and velocity of the stream; which further degrades performance. However, this leaves the question of what flow rate is “adequate” for structural firefighting. As with most questions, the answer is it depends. Before starting a discussion of the adequacy of given flow rates, it is important to provide a bit of context (as this is not a debate just for the sake of argument, it is important for us to understand not only what we do, but why we do it). Jason states that a flow rate of 115 gpm (435 lpm) will is inadequate and unsafe and that it will only contain the fire and not extinguish it (without stating fire conditions). Consider the cooling capacity of 115 gpm (435 lpm); this flow rate has a theoretical cooling capacity of 18.87 MW (7.26 kg/s x 2.6 MJ/kg = 18.87 MW). Given that this cooling capacity cannot be achieved in a practical sense it may be reasonable to say that the efficiency of hand held fire streams varies considerably, but as a point of illustration, consider an efficiency of 50% (half of the water is vaporized to steam). In this case, the cooling capacity of 115 gpm (435 lpm) would be 9.43 MW. 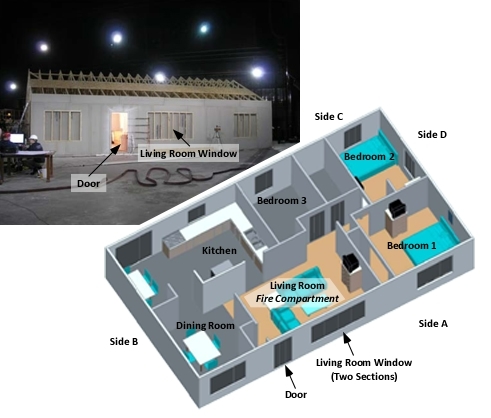 As a point of comparison, tests of a fully furnished modern living room conducted by Underwriters Laboratories resulted in a heat release rate of slightly less than 9 MW (Kerber, 2012) and could be readily controlled and extinguished with a flow rate lower than 150 gpm (570 lpm). I have no argument with establishing a minimum flow rate for 1-3//4” handlines (and actually use 150 gpm as the standard for the agency where I serve as Fire Chief). However, not all fires require 150 gpm (768 lpm) and in other cases 150 gpm (570 lpm) is inadequate. Safety is not driven by flow rate, but by appropriate or inappropriate use of a given flow rate depending on conditions. 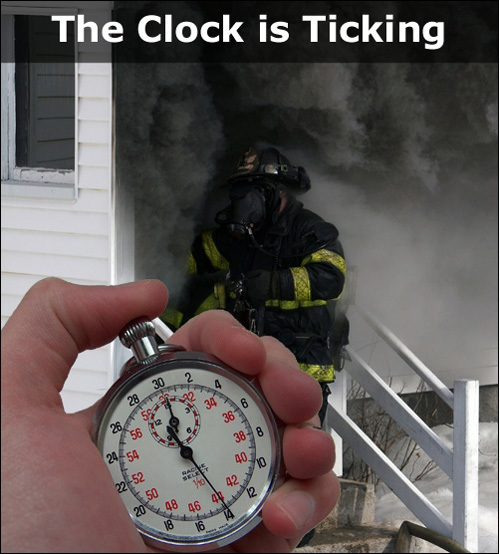 At a minimum, the flow must at least meet the critical flow rate (minimum to extinguish the fire) and more likely should be somewhat higher to reduce the time to extinguishment. Drastically exceeding the critical flow rate has considerably less impact on time to achieve extinguishment, but has a significant impact on the total volume of water used (which in rural contexts can be limited and in any context results in unnecessary fire control damage). If this resulted in increased firefighter safety, this might be a reasonable tradeoff, but I have not seen evidence that this is the case. Jason’s use of Lloyd Layman’s work as an illustration of how water fog is used in firefighting is misleading. 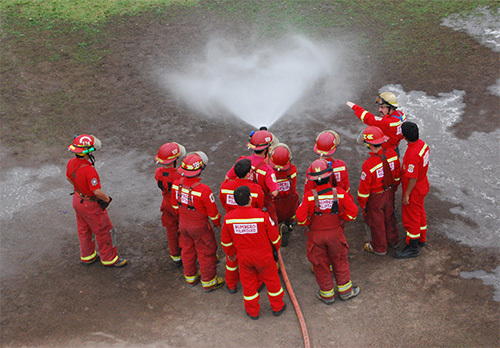 Indirect attack is only one way in which a combination nozzle can be used in structural firefighting. Jason is correct in that indirect attack involves production of a large volume of steam to cool and inert a fire compartment or compartments and that this method of fire attack should not be used in compartments occupied by firefighters (or savable victims). Jason states “the fog stream has a much larger surface ratio and little if any of the broken stream makes contact with solid surfaces or fuel source. Remember, our goal is to apply water to the fuel source, not to just cool off the thermal layer.” While, a fog stream has a much larger surface area than a straight or solid stream, the remainder of this statement presents a number of problems. First it is important to distinguish between a fog stream and a broken stream (which are quite different). A fog stream has much smaller droplets (which appears to be Jason’s point) while a broken stream (such as that produced by a Bresnan distributor) has much larger droplets. Jason’s second point that little if any of the water makes contact with solid surfaces of the burning fuel is in direct conflict with his claim that the fog pattern produces a large volume of steam to fill the compartment (as in Layman’s indirect attack). Due to the substantial energy required to heat water to its boiling point (specific heat) and vaporize it into steam (latent heat of vaporization) and the relatively low specific heat of the hot gases; water vaporized in the upper layer actually reduces the total volume of hot gases and steam in the compartment. Water vaporized on hot surfaces does not take appreciable energy from the hot gases and the volume of steam produced is added to the total volume of the upper layer, resulting in the lowering of the bottom of the layer and making conditions less tenable. For a more detailed discussion of gas cooling see my prior post Gas Cooling, Part 2, Part 3, Part 4, and Part 5. If in fact the water is not reaching hot surfaces, it would not have the effect that Jason describes. If it does reach the surfaces, resulting in the effect described, a fog pattern actually does cool hot surfaces and burning fuel. The fact of the matter is somewhere between these two extremes. Effective use of a combination nozzle allows for cooling of gases when this is the goal and cooling of hot surfaces and burning fuel when position allows direct attack. I agree with Jason’s third point, that the goal is to “apply water to the fuel source, not just to cool off the thermal layer” [emphasis added]. However, if faced with a shielded fire and direct attack is not possible from the point of entry, it is necessary to cool the hot upper layer to reduce potential for ignition of the hot smoke (fuel) and reduce the thermal insult to the firefighters below. This requires a stream that is effective at cooling the gases (rather than only or primarily surfaces). 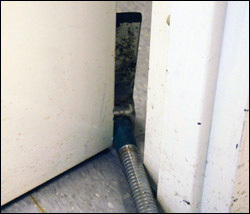 Once it is possible to apply water directly onto the burning fuel, this is critical as gas cooling is not an extinguishing technique, but simply a way to more safely gain access to the seat of the fire. For additional discussion of shielded fires and application of gas cooling see my previous post Shielded Fires and Part 2. It is indisputable that a fog pattern can be used to create a negative pressure at an opening such as a window or door to aid in ventilation and that a solid stream held in a stationary position and projected through the same opening will create less of a negative pressure and have less impact on ventilation. However, it is incorrect to state that the fog stream will always have this effect and thus will have a negative impact if used for interior firefighting. Development of the increased air movement described requires that the stream be positioned in an opening to create a negative pressure, thus influencing air flow. Intermittent operation on the interior does not produce the same result. Jason Sowders states “Let’s leave ventilation to the truck companies. Our main focus for the initial stretch should be extinguishment.” I have no argument that the main focus of the first line stretched should be confinement and extinguishment of the fire. However, engine companies have a significant impact on ventilation (and are an essential part of this essential tactic) in that all openings created in the building (including the door that the line was advanced through) are ventilation openings. 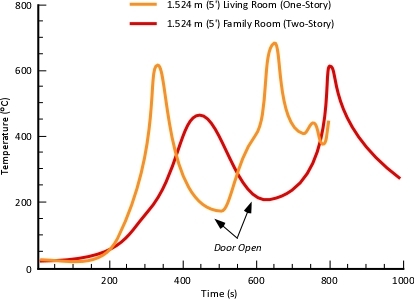 For more on the entry point as ventilation, see my earlier post Influence of Ventilation in Residential Structures: Tactical Implications Part 2 and the last several posts on door control; Close the Door! Were You Born in a Barn? 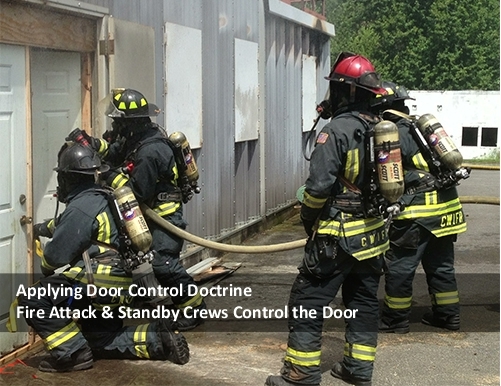 and Developing Door Control Doctrine. There are several interesting issues with these claims. First, if a fog pattern did not provide effective protection from radiant heat, fog streams would be ineffective protection when dealing with exterior flammable gas fires. However, this is not the issue here. As demonstrated in tests conducted by Underwriters Laboratories (UL) on Horizontal (Kerber, 2011) and Vertical Ventilation (Kerber, in press) as well as additional tests conducted by the National Institute of Standards and Technology (NIST) and the Fire Department of the City of New York (FDNY) (Healey, Madrzykowski, Kerber, & Ceriello, 2013), water does not push fire (for more information see the UL Report and On-Line Training Program Impact of Ventilation on Fire Behavior in Legacy and Contemporary Residential Construction. When a stream is operated continuously as in a combination attack where the stream (fog, straight, or solid) is rotated to cover the ceiling, walls, and floor and water is vaporized on contact with hot surfaces and burning fuel, steam is produced and the air flow developed by the stream aids in pushing these gases away from the nozzle and hopefully, towards an exhaust opening (half of the ventilation equation). Coordination of fire attack and ventilation is always important, but in this case ventilation in front of the hoseline is critical to safe and effective extinguishment. This is true regardless of the type of nozzle and stream used. Jason cites the disruption of the hot upper layer in the fire environment as a problem presented by application of water fog into the hot gases. He further asserts that a straight or solid stream will provide a more rapid knockdown by reaching the seat of the fire without premature conversion to steam or being carried away by convection currents. As with many of the other arguments in Jason’s post, there is an element of truth here, but not the entire story. As discussed above, application of water in a manner to produce steam on contact with hot surfaces will in fact disrupt thermal layering (regardless of the type of stream), this has given rise to empirical (observed) evidence that application of water fog into the hot upper layer has adverse consequences. However, if applied at a flow rate and/or duration that results in vaporization in the hot upper layer, conditions improve. Penetration is often cited as an advantage of straight or solid streams. This is true, provided that the stream can be directly applied to the burning fuel. Reach of the stream becomes particularly important when working in large compartments that are well involved. In many cases, firefighters must gain access to the fire compartment prior to being able to make a direct attack on burning fuel and thus may have need first cool the hot gas layer on approach and then make a direct attack. These two tasks may be efficiently accomplished using a combination nozzle to cool hot gases with pulsed application of water fog and a straight stream for direct attack. Jason emphasizes that solid stream nozzles produce a superior stream in comparison to that produced by a combination nozzle set on a straight stream. The primary rationale stated in this argument is that the stream is denser and droplets produced when the solid stream is deflected off the ceiling or walls are larger and have sufficient mass to reach the burning fuel without being vaporized in the hot gases or carried away by convection. As with several other of Jason’s arguments, this has an element of truth. Larger droplets are effective for direct attack due to their mass and smaller surface area, increasing the amount of water reaching the burning fuel. The effects of convection on a straight stream from a combination nozzle are far less pronounced in a compartment than they are when attempting a defensive direct attack on a large fire with a significant convection column. Jason concludes with the statement “We must be ready for battle with effective hoseline selection, nozzle selection, and flow rates…. It is our duty to be proactive when it comes to the constant changes our profession brings.” I agree completely! However, our strategies, tactics, and doctrine must be evidence based, must have a sound theoretical foundation and be supported by both scientific research and practical experience. Unfortunately, our profession continues to struggles to integrate these elements and is saddled with conclusions based on experience without understanding. Theory and scientific research does not trump experience, neither does experience trump scientific knowledge. Both are essential! The issues of flow rate and stream selection are not one sided, there is evidence for the effectiveness of both water fog and solid stream application for control of fires in today’s fire environment. It is easy to examine the evidence and choose the facts that support our preconceived ideas (regardless of your perspective). It is much more difficult to objectively evaluate the evidence and determine what conclusions are actually supported. We must continue to ask why and question our assumptions! Healey, G., Madrzykowski, D., Kerber, S., & Ceriello, J. (2013). Scientific research for the development of more effective tactics; Governors Island experiments July 2012 [PowerPoint]. Gaithersburg, MD: National Institute of Standards and Technology (NIST). Direct Attack: Water droplets put out the fire (droplets land directly on the burning fuel and cool this fuel to put out the fire). This is essentially correct, water applied directly to the burning fuel absorb energy as the water is heated and considerably more when vaporized into steam, this reduces the temperature of the fuel and extinguishes the fire. In the end, this is generally necessary regardless of what method of fire attack or fire control you begin with. Indirect Attack: Steam puts out the fire (water droplets turn to steam and this expanded steam eventually makes its way to the area where the burning fuel is and continues to absorb heat from this burning fuel until the fire goes out. All this steam also reduces oxygen concentration which results in a reduced heat release rate). This is close, but the process of steam production absorbs a tremendous amount of energy. So it might be more accurate to state that production of steam and that heating of the steam as the hot gases and steam reach a thermal equilibrium cool the fire environment. In addition, steam production reduces oxygen concentration that reduces heat release rate. 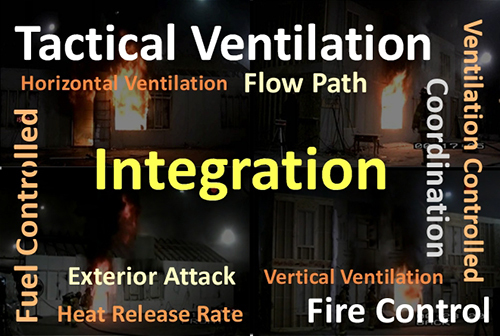 These processes in combination control and in fewer cases may achieve extinguishment. Indirect attack almost always must be followed up with aggressive overhaul and direct attack to achieve extinguishment. This does not diminish the utility of indirect attack for control of fully developed fires or decay stage fires resulting from limited ventilation (where high temperatures exist). Combination Attack: Water droplets put out the fire (the droplets act the same way here as in the direct attack). As with direct attack this is essentially correct. The application of water to burning fuel results in extinguishment through cooling. With the combination attack, some of the water is vaporized in the upper layer, assisting with control of the fire environment as well as the process of extinguishment. However, this is often at the expense of disrupting thermal layering (less of an issue when well-coordinated tactical ventilation is provided in front of fire attack. 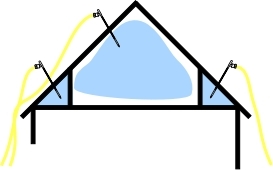 In the combination attack, although the hose stream is directed at the ceiling (indirect part of the combination attack) and creates steam it is not as effective at cooling the fuel as the direct part of the combination attack is (wow is that wordy), Therefore,the main purpose of the indirect part of the combination attack is to cool the overhead gases so the entire environment is cooler when firefighters enter and really doesn’t have much to do with extinguishing the fire. So would you say in this case the “indirect” part of the combination attack really isn’t a key contributor to extinguishment? This would depend (another way of saying “it depends”). The indirect component of the combination attack is important in controlling flaming combustion in the upper layer (such as rollover). While control of the burning gases overhead alone will not achieve extinguishment (same as with gas cooling), it is an important component of the extinguishment process as the heat flux from burning gases overhead is significant both as a threat to firefighters and also as a mechanism for heating unignited fuel and continuing the combustion process of fuel that is already burning. However, in the end, it is the direct element of the combination attack that achieves extinguishment. 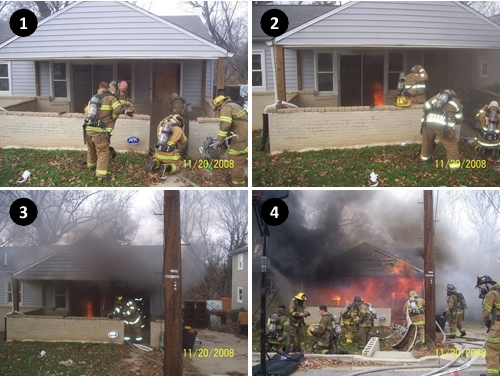 As with indirect attack, combination attack is followed up with direct attack to achieve complete extinguishment. If what I have said above is true then, although both the indirect and combination attack produce large amounts of steam, is the purpose of the steam production actually different (put out the fire vs. cool the overhead gases)? The purpose of steam production in both cases is to take advantage of the high latent heat of vaporization of water to achieve cooling. In addition, indirect attack reinforces the cooling effects of steam production by reducing oxygen concentration and thus reducing heat release rate from the fire. In his comments Stefan Svensson stated that “in order to put out the fire we need to hit it with water”, but from what we have discussed here, with an indirect attack it is not water putting out the fire but steam. In the indirect attack, production of steam and related effects on oxygen concentration result in fire control, but not necessarily extinguishment. Consider the potential outcome if you used an indirect attack on a fire in a building an did not follow up with direct attack and thorough overhaul. Likely a return visit to the same building some time later for a rekindle. In the end, when dealing with Class A fuels typically found in buildings, it is necessary to put water on fuel that is burning. When Nelson and Royer were doing their research on the Iowa Rate of Flow, did they use a combination attack or did they use and indirect attack and then develop the combination attack after their experiments? The combination attack was developed during their experiments. Initial application of water was done using an indirect attack (similar to that described by Lloyd Layman in Attacking an Extinguishing Interior Fires (1955). The Iowa State Story: The Iowa Rate of Flow Formula and Other Contributions of Floyd W. (Bill) Nelson and Keith Royer to the Fire Service – 1951 to 1988 (Wiesman, J., 1998) provides an excellent overview of Nelson’s and Royer’s work (but their discussion of fire behavior is inconsistent with current theory and terminology). While out of print it is available (used) through Amazon and a number of other used book outlets. There are many departments that will flow a straight steam ahead of them across the ceiling to cool the room as they make their way to the fire. I have read that this would be considered surface cooling and not gas cooling because a straight stream will pass right through the gas layer without cooling it and only cool the ceiling, upper wall and floor surfaces as the stream bounces off the ceiling and land on the floor. I have a few questions about this. When straight stream from a combination nozzle or a stream from a solid bore nozzle deflects off the ceiling, does the stream get broken up enough that the droplets become reduced in size enough that they will cool the hot gas layer on the way down to the floor or are they still too large and therefore pass right through the hot gas layer without cooling it? There is some cooling, but it is less efficient than when a fog pattern is used as the large droplets will be more difficult to vaporize. If temperature is extremely high, some cooling will occur as even large droplets may be vaporized. If the stream can reach the seat of the fire, this inefficiency may be less significant as the fire will likely be controlled by the direct element of the combination attack. When faced with hot gases or flaming combustion overhead with a fire that is shielded from direct attack, cooling the gases with pulsed water fog will be considerably more effective and efficient than use of a solid or straight stream. When the stream cools the ceiling and upper walls are the ceiling and walls now able to absorb more heat from the upper gas layer ( so this actually would be gas cooling) and if so how effective is it at cooling these gases (how much heat can these cooled surfaces now absorb from the hot gas layer)? As discussed in my last post, gypsum board (a typical compartment lining material) which has a specific heat of 1.017 kJ/kg (Manzello, Park, Mizukami, & Bentz, 2008). This is one quarter the specific heat of water and half the specific heat of steam. So the indirect cooling effect of removing energy from compartment linings is quite inefficient at cooling the fire environment. Once you have created steam from applying water to the ceiling and upper walls—-does that steam not now effectively cool the gases? I know you need smaller droplets suspended in the gases to absorb heat from the upper gas layer and steam would certainly meet that criteria. The specific heat of steam is 2.0 kJ/kg as compared to the combined theoretical cooling capacity of 2.6 MJ/kg when water is heated from 20o C to 100o C and vaporized into steam. While steam will cool the hot gases until they reach thermal equilibrium, but to a lesser extent than water fog applied into the hot upper layer. Stefan Svensson mentioned in his comments that “sometimes fog nozzles are the best way to apply water to fire and sometimes it’s straight streams”. You often hear blanket statements being made about straight streams producing less steam and only fog streams can cool the gas layer. I was wondering if you could expand on the misconceptions and highlight some of the better practices we need to know about using the different streams from a more scientific point of view? When approaching a fire are we better to use both straight and fog patterns to cool the room as we make our way to find the base of the fire? In a conversation with John Wiseman, Keith Royer stated that “there is not just one tool that will solve all fire problems”. The perspective that there is only one way to approach structural firefighting is dogmatic. Dogma is a point of view or tenet put forth as authoritative without adequate grounds. The simplest answer to your question is that when cooling gases, a fog pattern is more effective and when applying water to surfaces, the pattern selected may depend on the distance from the surface. When far away and the stream must be applied through a hot atmosphere, a solid or straight stream will likely be most effective, when close, a straight stream or fog pattern may be equally effective. A question unrelated to this discussion but I am sure you can help me with. I am sure you are quite aware (or involved with) that excellent video called “kill the flashover” that shows the effects of closing a door. I know that the temperature stops increasing due to the lack of oxygen for heat release. But, not only does the temperature not increase but it actually quickly decreases. This decrease is due to the fact that the walls and ceiling are absorbing the heat causing it to drastically reduce so my question is this; if that fire was allowed to burn for long enough that the walls could no longer hold any more heat, then the door was closed, would the temperature drop have been less and would it have lowered more slowly? The reason the temperature dropped so quickly was not due to the absorption of energy by compartment linings, but by reduction of heat release rate (HRR) due to consumption of oxygen within the compartment. So, it would not make a significant difference if the fire had been burning longer. The higher the HRR, the more quickly you would see an impact. This also influences the visible fire behavior indicators (smoke and air track) on the exterior. As demonstrated in the UL ventilation experiments and previous work by NIST, visible smoke and air track indicators decrease dramatically as the fire becomes ventilation controlled due to a reduction in temperature (and resulting reduction in pressure inside the building). Thanks for the great questions, let’s keep the discussion going! 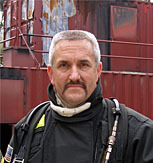 The next set of questions comes from Garland TX regarding “Flashover Training”. A bit of controversy here in a number of areas! Layman, L. (1955) Attacking and extinguishing interior fires. Boston: National Fire Protection Association (NFPA). Wiesman, J. (1998).The Iowa state story: The Iowa rate of flow formula and other contributions of Floyd W. (Bill) Nelson and Keith Royer to the fire Service – 1951 to 1988. Stillwater, OK: Fire Protection Publications. As I was beginning work on a post focusing on fire attack methods and fire stream effectiveness, I received an e-mail from Captain Mike Sullivan with the Mississauga Ontario Fire Department asking for help in clarifying indirect and combination fire attack methods and their impact on the fire environment. Mike is particularly interested in how to explain the method of extinguishment in the various methods of fire attack discussed in the International Fire Service Training Association (IFSTA) Essentials of Firefighting. Direct Attack: This is fairly straight forward; water is applied directly to the burning fuel to cool it to the point where there is no longer pyrolysis (below its ignition temperature). As Mike explains, the concept and mechanism of direct attack application of water to burning fuel to cool it. However, it is important to remember that combustion does not necessarily cease when flaming combustion is no longer visible, surface combustion can continue unless sufficient cooling is accomplished to not only extinguish flaming and surface combustion, but also to cool the fuel to the point where it is no longer pyrolizing. Indirect Attack: Here is how I would like to explain it. This is used when the seat of the fire cannot be readily accessed. Water is applied from the exterior of a very hot compartment (1000 degrees [F]+ at the ceiling) with limited ventilation. The goal is to create as much steam as possible. To do so you can begin with a fog stream since it is the most effective at cooling therefore creates more steam. The fog stream should be directed at the ceiling where it is hottest. Due to the fact that the stream has limited reach you will then want to narrow your stream eventually using straight stream. The idea is to reach as much of the room as possible. When a straight stream hits the superheated walls and ceilings it will also create a huge amount of steam as it cools the surfaces (most people don’t consider that a straight stream can create a lot of steam). The goal is to do this very quickly then close the door or window and let the steam do its work. There is one main question I was hoping you could help me with here since I have read different theories. What is the main mechanism of extinguishment here, does the steam continue to absorb heat to cool the room down and extinguish the fire or is there so much steam created that it excludes the oxygen therefore smothering and not cooling the fire (I realize both are actually happening), basically does this technique mainly cool or smother the fire. This is a complex question in need of a simple answer. The simplest answer is that the primary method of extinguishment is cooling. The complexity is in that the cooling is accomplished by several mechanisms. First, water heated from 20o C to 100o C and vaporized into steam absorbs a tremendous amount of energy based on its specific heat (energy required to raise the temperature of a specific mass of water by one degree) and latent heat of vaporization (energy required to change a substance from liquid to gas phase with no increase in temperature). Water has a specific heat of 4.2 kJ/kg and a latent heat of vaporization of 2260 kJ/kg. Heating a single kilogram of water from 20o C to 100o C and vaporized it into steam, requires 2.6 MJ of energy. In addition (and contrary to common belief in the fire service) steam produced in an environment above 100o C continues to absorb energy and increase in temperature until the temperature of the steam and the surrounding environment is equalized. Steam has a specific heat of 2.0 kJ/kg. This compares to the specific heat of smoke of approximately 1.0 kJ/kg (Särdqvist, 2002) and gypsum board (a typical compartment lining material) which has a specific heat of 1.017 kJ/kg (Manzello, Park, Mizukami, & Bentz, 2008). Water converted to steam in an indirect attack absorbs a tremendous amount of energy and the steam continues to absorb energy as the temperature in the compartment moves towards equilibrium. As with gas cooling or direct attack, some of the water is vaporized in the hot upper layer and some is vaporized in contact with hot surfaces (compartment linings, burning fuel, etc.). As the specific heat of smoke and compartment lining materials are lower than the specific heat of water (as a liquid or steam) and considerably lower than the latent heat of vaporization of water, the temperature of the smoke and compartment linings will drop to a greater extent than the temperature of the steam will increase (for a more detailed discussion of the cooling effects of water along with a bit of math, see Gas Cooling Parts 1-5). Steam produced in and enclosed space also reduces oxygen concentration. As oxygen is required for release of energy from fuel, this can also be considered an extinguishing method. Reduction in oxygen concentration results in decreased heat release rate (HRR), which correspondingly results in a decrease in temperature. So in reality it is all about cooling (largely accomplished by vaporization of water into steam along with reduction of oxygen concentration). Combination Attack: We seem to have a real problem with this one. When I ask for an explanation of this technique I usually get “T”, “O”, and “Z” pattern as an answer. As a matter of fact a neighbouring fire department has these 3 letters painted on their walls to practice the pattern, again we are dealing more with technique instead of method of extinguishment. My explanation is that these patterns are merely a way of creating steam by cooling all surfaces in the room as well as allowing the water land on the burning fuel to cool it. What is the main mechanism of extinguishment here is it the creation of steam (and again what is the steam doing, cooling or smothering) or is it the water on the fuel cooling it. Also, would you recommend using a fog stream to create steam as it cools the gases and nearby surfaces then switch to a straight stream to create steam as it hits more distant surfaces (walls ceilings). The combination attack is intended to both cool the hot upper layer and apply water to burning fuel (less so to cool compartment linings, although this is accomplished as well). The term “combination” refers to the combination of direct and indirect attack. 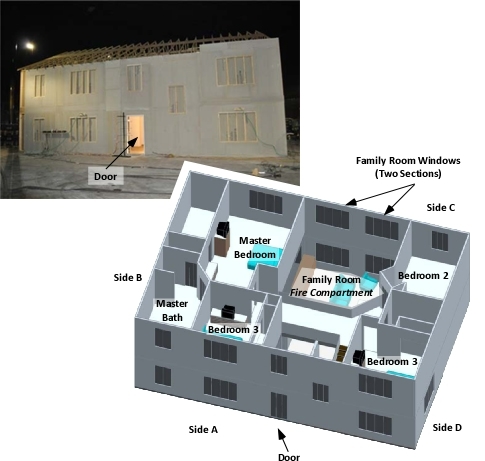 As indirect attack is not applied in an occupied compartment due to steam production (on contact with compartment linings), it is critical ventilation be provided in front of and closely coordinated with fire attack. As with the other methods of fire attack, the principle method is cooling. As to your second question regarding use of a fog stream to create steam as it cools the gases and nearby surfaces and then switch to a straight stream to cool more distance surfaces. A combination attack may be done with a narrow fog pattern, straight stream, or solid stream. Reach in this case is a good thing. Cooling of hot gases overhead (with a little cooling of compartment linings) is the basic concept used in gas cooling. This technique is most commonly used to control the fire environment when the fire is shielded from direct attack and is not an extinguishing method. This approach does not result in an increased volume of steam and smoke and related lowering of the upper layer. In fact if approximately 35% or more of the water is vaporized in the upper layer, the total volume will be reduced (see Gas Cooling Parts 1-5 for a more detailed explanation of why). This technique can be effectively combined with direct attack on burning fuel and painting of compartment linings to lower their temperature. Painting is a gentle application of water to cool without excess steam production. I believe that the Fire Streams and Fire Control Chapters in the 6th Edition of the International Fire Service Training Association (IFSTA) Essentials of Firefighting provide a more clear discussion of fire attack methods inclusive of direct, indirect, combination, and the technique of gas cooling. International Fire Service Training Association (IFSTA). (2013). Essentials of firefighting (6th ed). Stillwater, OK: Fire Protection Publications. A number of years ago, several nozzle manufacturers developed a break apart combination nozzle (shutoff separate from the tip) with an integrated solid stream tip. This design allowed the user to adjust the pattern using the combination tip, or if desired, remove the combination tip and use the nozzle to develop a solid stream. Good idea or not? On the surface this sounds like it might be a reasonable idea. The combination tip allows adjustment of the pattern while the internal solid stream may provide improved performance in penetration to reach burning fuel surfaces. In addition, if the combination tip became clogged with debris it is also possible to remove the tip and still have the capability to develop a usable fire stream. Used on various size handlines, internal solid stream tips are generally available in sizes ranging from 7/8” to 1-1/4”. What effect does an integrated solid stream tip have on nozzle performance when a combination tip is used? Manufacturers such as Elkhart Brass and Task Force Tips warn that the integrated smooth bore tip may restrict the flow of single flow, variable flow, or automatic combination tips. 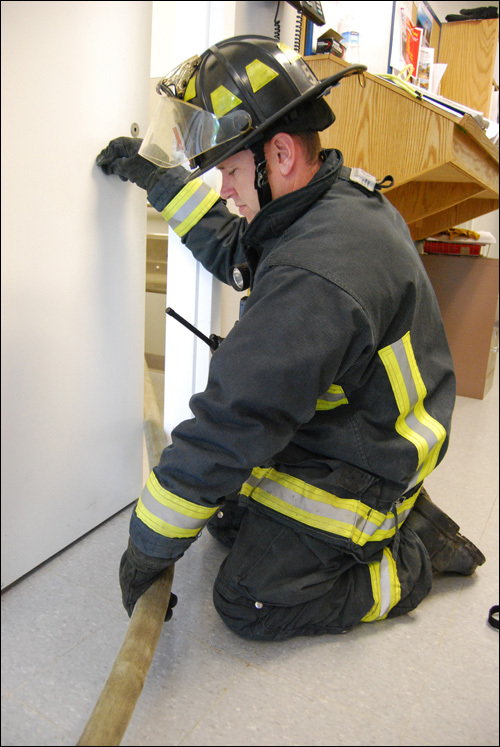 Tests conducted by Firefighter Jim Huff of Central Whidbey Island Fire & Rescue (CWIFR) demonstrate the potential friction loss impact of integrated solid stream tips. CWIFR conducted flow tests using an mid-range Elkhart Phantom tip, a 1-1/2” (38 mm) ball valve, and a 1-1/2” (38 mm) ball valve with an integrated 15/16” (23.8 mm) tip. Line gages were inserted at the base of the nozzle and between the shutoff and the tip. Nozzle inlet pressure was adjusted to maintain the designed nozzle pressure of 100 psi (690 kPa) at the tip and pressure measurements were made at each of the nozzles flow settings of 30, 95, 125, 150, and 200 gpm (114, 360, 473, 658, and 757 lpm). As illustrated in Figure 1, the ball valve without the integrated tip had limited impact on tip pressure. However, the results obtained when using a 1-1/2” (38 mm) ball valve with an integrated 15/16” (23.8 mm)solid stream tip were dramatically different. As illustrated in Figure 2, a considerably higher inlet pressure was required to provide the designed operating pressure of 100 psi (690 kPa) at the tip. When equipped with an integrated solid stream tip, the friction loss in the nozzle shutoff is significantly impacted by tip size (the smaller the tip, the greater the friction loss at a given flow rate). It is essential that firefighters, apparatus operators, and fire officers have an in-depth knowledge of their tools. 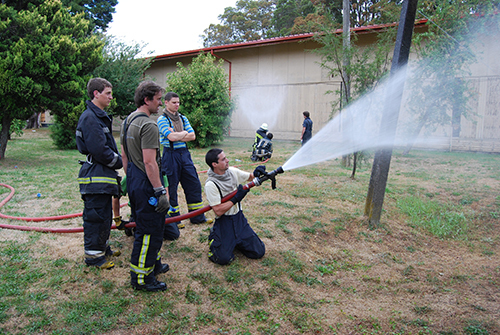 A handline nozzle is your primary firefighting weapon in offensive firefighting operations, develop your nozzle knowledge and master this important tool.